When it comes to quick weeknight dinners (or a meal that’s fun to make if you want to get the whole family involved), nothing beats a stir fry. This stir fry bundle provides 5-6 different varieties of farmers market produce, enough for about three adult-sized portions. You provide the rice, sauce, and protein as desired, and we’ll take care of the rest. Past selections include carrots, onions, bok choy, broccoli, cabbage, bell peppers, celery, green beans, mushrooms, zucchini, eggplant, scallions, ginger and garlic. All vegetables are sourced directly from local farms including Anna’s Family Farm, Denny’s Organic Farm, Gourmet Specialties, JF Organic Farms, Jimenez Farm, John Givens Farm, JR Organics, Moua’s Farm, Rancho La Familia, Smith Farms, Stehlhy Farms Organics, Summer Harvest Farm, Tamai Family Farms and Wholeness Farm. To make a basic stir fry: Wash produce. Peel an onion, 2 cloves garlic and a 1â piece of ginger. Chop onion and mince garlic/ginger. Peel remaining vegetables as desired and discard seeds/stems. Chop into bite-sized pieces, keeping harder vegetables that will take longer to cook separate from softer vegetables. Heat a wok or large skillet coated with oil and sweat onions, stirring occasionally. Add garlic/ginger and cook until fragrant (not brown.) Add firmer vegetables and stir-fry over high heat, cooking in batches and pushing cooked vegetables to the side of the pan. Add softer vegetables and cook until fork tender and leafy greens are wilted. Add pre-cooked tofu or meat cut into bite-sized pieces, and heat through. Add your favorite spices/sauces/seasonings. Stir to combine. Sprinkle with sesame seeds or scallion tops. Experiment with your favorite ingredients and create new flavor combinations. You could also create a marinade with your favorite sauces and seasoning ingredients, and marinate cut vegetables for at least 15 minutes before cooking.Locally grown produce selected by our personal food shoppers. 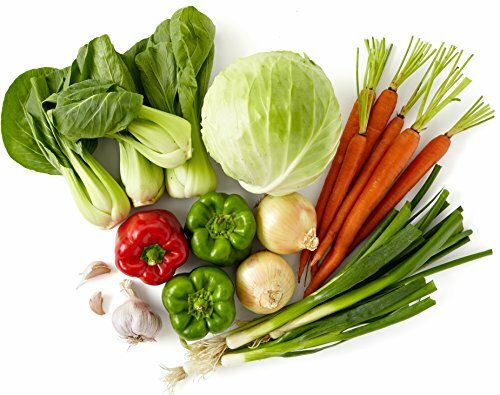 This bundle most likely includes cabbage, onions, herbs, peppers, broccoli, and/or asian greens. Selections vary according to the season and availability. Produce sourced from local farms, most of which utilize organic and sustainable growing practices.